Dragon Ball FighterZ introduces Party Battle and confirms a new mode. This week, Tomoko Hiroki – game producer at Bandai Namco – revealed a new mode in the recent update for Dragon Ball FighterZ. In addition to announcing a new, upcoming mode – FighterZ Cup – Hiroki focused largely on the former. In Party Battle mode, players team up in groups of 3 to defeat a powerful boss enemy. This cue is similar to games, like Street Fighter V and Mortal Kombat XL, where you can fight an overpowered character unit for bonuses and prizes. However, this mode is online and thus allows players to team up with two more fighters. Keep in mind this event lasts until May 21st at 11PM PT. In this mode, you can search for players of similar skill level and region and coordinate strategies with your teammates. You have Stamps and Preset Messages enabled and can adjust your difficulty. This affects the number of battles and the level of difficulty your enemy A.I. is set to. 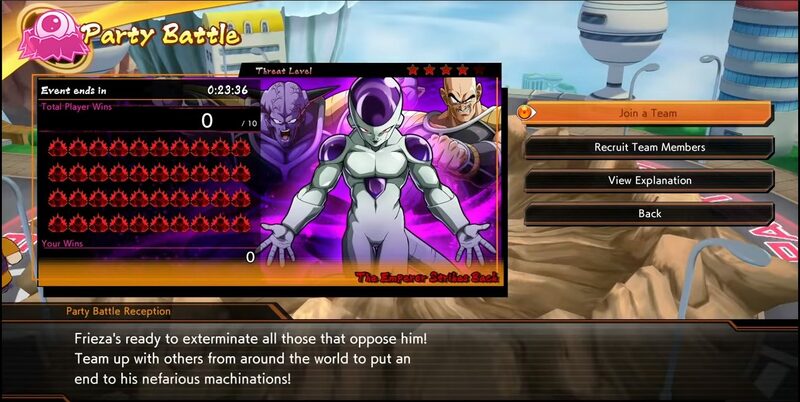 In this case, this limited battle is against Frieza, who starts at Level 40. Based on the configurations of the Story Mode, the boss character will have more health and strength with each passing battle. In Level 5 and 6, Frieza will have Captain Ginyu and Nappa backing him. Finally, Level 7 features a Level 94 Frieza capable of swiping an entire bar of health with one Nova Strike. In my experience, I used SSJ Vegeta. His assist is great for assists and stalling out his Sparking. Having at least one solid assist character is crucial. However, the A.I. reads you incredibly well and can simply Level 3 you without any time to block it. Be sure to prepare well and communicate with your team! You can use presets mid-battle to cheer or ask for a tag-in. Be sure to check the official update. As mentioned earlier, FighterZ Cup was mentioned by Bandai Namco. However, it has yet to be detailed or featured with a release date. More DLC characters are coming. However, there’s no word yet on the release date of the upcoming DLC featuring Zamasu and Vegito. But keep checking back on our site! In the meantime, you can order Dragon Ball FighterZ here. Thank you for reading our coverage! Have you beaten Party Battle yet? Do you have any tips to share with our readers? Let us know in the comments below! Previous Post« Previous Why do cats roll around? Find out here!